JUST SO WE’RE CLEAR…there is absolutely no point to any of this. Because I am tired, and really should be taking a shower and going to bed. But instead, I’m writing rambling posts about absolutely nothing at all. Because this makes perfect sense in some alternate reality, I’m sure. What I wanted to point out is that one of the definite downsides to This Thing I do where I have my hours shifted sharply back in order to better span the gap between our Charlotte (and other Points East) team coming online and our San Francisco team ambling in is that it is frequently rather hard for members of the San Francisco team to really get their arms around just how much earlier I got started. Like, on average, most of the SF crew starts arriving at about 9:00 our time. But I’m usually starting around 9:30 Charlotte time – or 6:30 our-time. And given that most days tend to go by in this very colorful blur of meetings and quick-questions and ermahgahd, it’s ON FIRE! moments (translation: what lunch hour? ), I’m really ready to call it a day by 2:30-3:00. Which coincidentally is when the Denizens are starting to need rides home from school and such. <= you see the beauty of this schedule now? But, unsurprisingly, it is very hard for someone who started work at 9:00-ish to really comprehend that while they may not have started interacting with me until about then, I had already been working a good three hours before they arrived. And thus am going to theoretically be leaving a good three hours before they do. Using a little trick I like to call MATH, allow me to illustrate how this works. 6 a.m. + 8 hours = 14. 14:00 hours = 2:00 p.m.
Add 30 minutes for the lunch I theoretically took but probably didn’t, and by 2:30 my-time I’m done. Now, you add to that the fact that we are currently up to our eyebrows in the project from hell – the project that has about 75% of the team two seconds from rage quitting pretty much 24/7 right now – and I’m not just ready to be done, I’m so done that I redefine the term done because I’m done to the point of SUPER done-ness I mean, really, like, DONE-done, signing off, sayōnara, cya, l8r, XOXOXO, BYE NOW. If you don’t believe I’m leavin’, just count the days I’m gone, y’all. !! Done, exclamation point !! Which is pretty much what I did at 3:00 sharp this afternoon, and why I did not respond to the insistent pinging of instant messages about an hour and a half later, although I did make a mental note that the next time I leave my laptop up and running after being technically done for the day, I need to either sign out of that instant message application, or, turn the sound off on the laptop. Because, Problem Solving: Yet another of my many skills. Now, I will grant you that I have a…slightly off-beat sort of existence. I am a person who tends to view the world in a way which evidence suggests is not the way most people do. I can become extremely worked up over things that nobody else would, and then turn right around and find something amusing that causes everyone else around me to grab the nearest paper sack and start self-medicating on CO2. Which I recently learned is not recommended anymore, by the way. These are the sorts of things you will learn when you hang out with people like me, because we tend to collect such odd bits of information, find them fascinating, and playfully (and incessantly) trot them out whenever we think it might be useful or interesting to others. One piece of information we seem to find extremely hard to collect is how to tell when such pieces of information might be useful or interesting, which is why we frequently trot them out randomly or at times that only add to the general stress levels of Everyone instead of the intended purpose of amusing or assisting. POINT BEING, I’m not particularly surprised to find myself living in a house with green beans for curtains, or soaking my feet in strange concoctions to see if they really do improve circulation, or having to go out to the garage and shift a bunch of extremely heavy food-grade tubs looking for the one that has the wheat gluten in it. Between being curious about if/how it would work and enjoying the experience of the odd situation, I’d be more surprised not to find myself with something weird going on at any given time. This one…rather takes the cake. That’s not a bag of chocolate chips. That’s three bags. That big container next to the bag? => The contents of two more bags of that same size. Or, what was left of them. That’s right: The plot thickens. So I went out to the garage a while ago for something – I forget what, but it was probably important and I will be very sorry that I got distracted by The Great Chocolate Chip Gate Scandal of 2014™ in a little while. And as I was opening the cupboard to get whatever it was, I glanced down and saw brown things on the shelf below it and at first I thought it was cat food and was all, dammit, Tim, how many times have I told you, you can-NOT leave their food lying around like this, the MICE will come back! Because of course I immediately not only blame my husband for such things, but lie to myself about having said anything about it to him more than maybe once. Probably while he was partly or mostly asleep, because that’s a thing I do. But at that moment, in my mind, I have full-on discussed this with him, in some big board-room kind of place with a large oak desk and serious minions nodding and agreeing with everything I said, at least ten thousand times. Possibly THIRTY thousand. But before I could really work up a good head of steam on being mad about the possibility of spilled cat food attracting mice, my brain registered the color. @^*&@ hell, THAT’S MOUSE POOP! @^*&@ IT ALL, TIM, WHAT DID I TELL YOU ALL THOSE TIMES I TOLD YOU, THE @^*&@ING MICE! THEY’RE POOPING! ON MY GARAGE SHELVES! But as I was composing the angry text he was going to receive soon, my brain – continuing its slow, grinding way toward full disclosure – pointed out that that would have to be one big mouse. Mouse poop tends to be rather small. And elongated. And very unlike a Nestle’s chocolate chip, really. 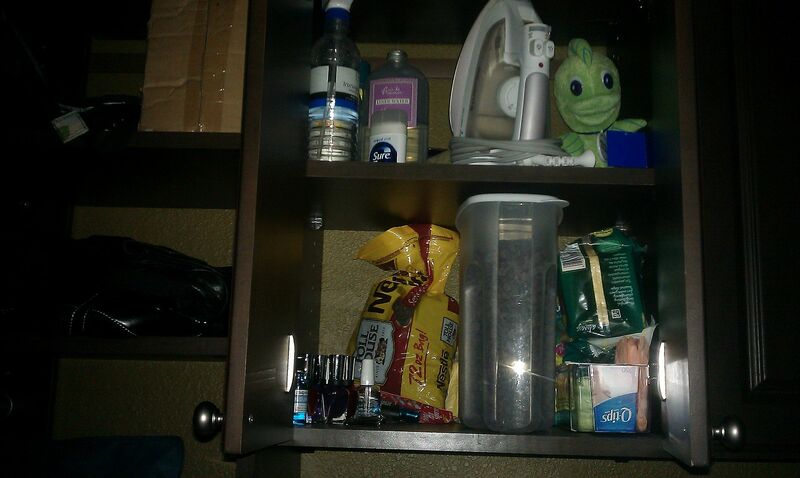 …and sure enough, there was a jaggedly torn open bag of chocolate chips, hastily shoved back into the cupboard. I promptly hit the ceiling. This has been a repeated problem in the Den of late, and it is really starting to piss me off. I’d thought we were finally past the whole issue: For a good long while, I had to keep everything except the unsweetened chocolate disks sealed up in one of those pickle-bucket style food storage bins – and store the bin waaaaaaaaay in the back, under literally two other tubs full of things like fifty pounds of rice and twenty-five pounds of pinto beans. But it had seemed to slow down. And the last time I’d picked up those wholesale-sized bags of chips, I’d just quietly put them where they had always gone in the cupboard. …siiiiiiiiigh…nothing says “home cooking” like chocolate chip and wood shaving cookies, yum! Naturally when questioned, all Denizens immediately assumed wide-eyed expressions of shocked innocence. So I went to the closet where I keep all my larger plastic containers to find something I could put the now air-exposed chocolate chips into. And as I was digging around looking for a right-sized container…guess what I found? Another torn-open bag of chocolate chips. Hastily shoved into the back of the closet, precariously balancing on the backs of a bunch of Mason jars. I poured the two opened bags into a big container more commonly used for cereal. And I got the unopened bag from the highest kitchen shelf where I’d hidden it behind the icky brown rice and boring unsweetened coconut. And I hauled all that chocolate upstairs, and put it into my own closet. In order to get to it now, they have to enter the veritable lion’s den. During the day, they have to get past me as I sit here working. And any other time, well, this floor is pretty creaky up here, so anybody walking into that closet while I’m, say, in the kitchen? ==> gonna be heard. Your move, Denizen. Your move.